Because the waste oil contain too much contamination, including non-hydrocarbon, alkene, polycyclic aromatic hydrocarbon, metal hydronium, impurities, metal particles, asphaltene and colloid etc. 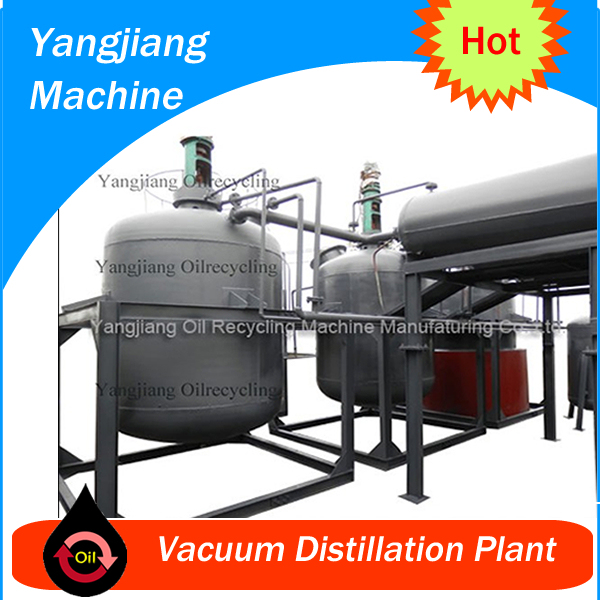 and due to the traditional technology only can refine the waste oil to base oil, can’t use directly, so our company is researching the new technology about distilling machine, which can distill all kinds of waste oil into clean oil, easy to operation, and the lower operation cost. This equipment adopt physicochemical actions to polymerize,passivate, absorb and eliminate impurities and harmful contamination. We research a new chemical alkaline complex catalyst, which can restore and regeneration the Waste oil to clean oil, save the component of the oil. It’s easy to produce waste residue and bad smelling by traditional vitriol distilling, which will bring potential secondary pollution, moreover, it’s easy to change the color to black and produce the odor due to the recycled oil react with the oxygen. But after we use the alkaline complex catalyst refines the oil, the recycled oil havn’t change the color and havn’t create the odor. What’s more important, you can use the resid to be as the fuel to heating the oil, without any pollution. 2. Easy to operate,low operation cost, only 1-2 workers can control the machine. 3. The machine can recycle gasoline motor oil, diesel motor oil, all kinds of engine oil, and other lubricant oil to clean oil. 4. Environmental friendly. This machine is full-enclosed, there is no any harmful smell come out form the machine, colloid, oxid, acid, pitch will be converted to oil sludge, can be use as bitumen and fuel. 5. 85% high recycling rate. This includes 6-8% diesel and gasoline mixture,80-85% base oil and 8-10% oil sludge. 7. High quality refined oil, no any discoloration caused by oxidation, no any bad smelling. YANGJIANG offers Innovative & Environmentally Friendly Solution for used lube oil recycling, used lube oil re-refining, specially suited for small & medium size plants.